Just north of Reno in Lemmon Valley – hasn’t been this deep for near twenty years. I80 closed for a couple of days while the clean up a mudslide covering both sides of the freeway near Floriston. The Truckee in flood from Sparks to Nixon. Sierraville and Graeagle with water in the streets. And that is in the shadow of the Sierra Nevada Range. Is your bookmark collection rather empty? Here are some you might find interesting. SpaceNow * Education. Arguments. Ideas. Doug Gilford's Mad Cover Site – remember that magazine? wayback when? Vintage Trailer Supply – Parts, Supplies & Merchandise for Vintage Travel Trailers! TopoZone – The Web's Topographic Map, and more! Recycled Tire Mats – Bedliners, Traction Strips, Marine Matting, Kennel Mats! Campfire Buzz – This is a site dedicated to people that love the outdoor and RV lifestyle. It contains tips on RV maintenance, Oregon campgrounds, live chat forums and information on RV sales. Batterytender.com – Home of All Your Charging Needs Home of the the World's Most Advanced Battery Charger! Longer Battery Life, Less Maintenance! Simply the best chargers for automobiles, motorcycles, atv's, boats, planes, golf carts, rv's,	tractors, and more! 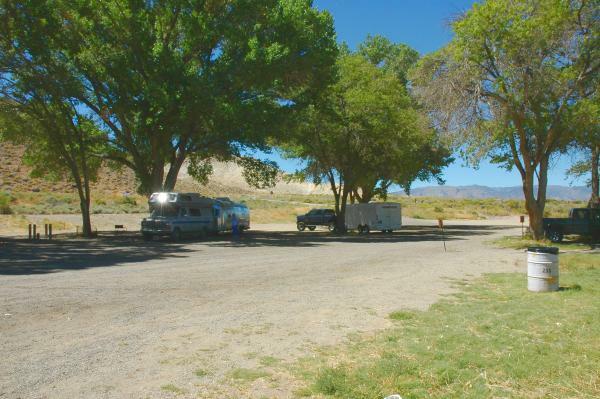 RV Education 101 – videos, DVDs, books and information for RVers – RV videos, DVDs and books on how to use and maintain your recreational vehicle. RV University – RV University- It is our goal to assist you in learning how to use and maintain your Recreation Vehicle. Sky and Telescope – The Highest Full Moon Overhead – Sky & Telescope, the Essential Magazine of Astronomy. News, observing tips, how-to advice, and more! SPACE.com — The Forgotten Winter Constellations – Orion dominates the winter night sky. But there is a lot more to look for. How to Fix a Leak … in the HULK! Macworld: Feature: Emergency fixes for bad photos – Despite your best efforts, some photos just turn out bad. But what if the bad photo in question is that one shot in a million? You may not be able to turn a bad photo into a well-shot photo; however, with a little creative problem solving, you might just be able to turn it into something worth keeping. Rick Blanyer of Austin Texas – icky on rv.net seems to know what he is talking about when it comes to batteries and it does make sense. As a long time designer of batteries (particularly AGM) and holding 5 patents in this technology, I am always tickled by the mystery surrounding this subject. … The agm technology was invented in 1965 but was used mostly on military stuff due to cost until about 10 years ago. It uses a recombinant oxygen cycle. That is why the glass separators are about 95% full, so the O2 produced at the positive plates during overcharge can pass thru and recombine on the negative plates and reform H2o instead of escaping as gas. This technology uses the same materials as a flooded cell, except the recipies for active materials are slightly different, and the cells are under compression to facilitate recombination. The main characteristics of agm are ability to suffer more deep discharges than flooded cells, lower internal impedance that produces substantially higher currents if needed, ability to accept very high charge currents without damage, lighter, works in any position, no venting (except during overcharge) means almost no post corrosion. The max charge voltage is 2.40 volts/cell at 77F. This is 14.40 volts at 77F. (Flooded cells require up to 2.60 volts at the same temp.) This voltage must be compensated +/- a couple of millivolts/F. … . in RV/marine use when a diode isolator is used, the diodes normally have a forward drop and this reduces your total charge voltage. Generally this means that charging on the alternator alone will never fully charge an agm battery. Good reason to plug in to shore power once in a while to top it off, but don’t leave it permanently plugged in because if you overcharge and lose water you will be up the creek. Incidently an agm battery can be charged at the same max amps as its rated discharge. In fact the battery works better when slammed with high charging currents (100+ amps if you are below 14.4 volts), because this causes slight internal heating which promotes formation of a particular crystal structure on the positive paste (Beta PbO2). They like it like candy. After performing thousands of autopsies on failed batteries,… the failure mechanisms are on most deep cycle batteries. It’s the same as Dunlop’s disease where when you eat too much, your stomach done lopped over your belt! The culprit is usually the positive plates. When charged they are PbO2, but when you discharge the cell the positive paste goes to PbSO4 which is 40% bigger volumetrically than the PbO2. This stretches the metal grid (the conductor that transports the electrons out of the cell). Now unfortunately the grid is made of lead, a metal which has a very poor electrical conductivity but is the only economical conductor that will survive in sulfuric acid solutions. To make matters worse, lead has only about 1000 psi of tensile strength even in its best alloys. This is about as strong as your ex-wife’s pancakes. So when the positive paste (attatched to the grid)expands by 40%, it stretches the lead grid in the x-y direction. Now when you recharge and the PbSO4 in the positive paste reconverts back to PbO2 and shrinks, that stubborn lead grid now possesses an extremely high compression strength and doesn’t budge. So the grids curve in the z axis (ever notice the bulge on the ends of a wore out battery?). This separates the plates over time and causes internal resistance to rise. What is even worse is that the paste pellets that lie within the grid spaces become cracked during shrinkage and no longer touch the grid metal and that pellet can never be recharged again. It stays lead sulfate (PbSO4) and the battery is said to be “sulfated”. This is bad and is like having your black tank clogged up, can’t live with it. The capacity of the battery gets lower and lower. This problem is much worse on thin grid cells like starting batteries and is why they are only good for about 10 deep cycles before they are trash. Keep this in mind when you are deep discharging your rv batteries, it will happen to them eventually if you overdo it. I wouldn’t go past 80% discharge, about 11.5 volts. Of course the voltage can only be accurately checked if several hours have passed since the last charge or discharge to allow the acid to equilibrate. What a big help this is right? Well actually if you see the voltage go down to 11.5 while you are under load, that is a good place to quit. Get back on charge as soon as possible. Why? Because when you fully discharge a lead-acid battery, you drive the gravity of the acid down to almost water. Lead dissolves in water and basic solutions, but not in acid solutions. So if you let it sit dead, then the lead in the grids and paste will start to dissolve in the water (it only takes a couple of hours). And when you start recharging, the gravity starts to rise and the water slowly becomes acid again. Now the lead precipitates out of solution (remember it only dissolves in water or basic solutions), and to everyone’s surprise it doesn’t go back to where it came from. It usually forms a dendrite which is a tiny short between the + and – plates. Drat. What a disaster. Back to the store. Got that? Now you know more about AGM batteries, Why deep cycle batteries are different from starting batteries, why deep discharging causes battery failure over time, why you need to recharge promptly and how to know when you’ve pulled enough from the battery and need to recharge. A podcast is an audio file that you can download to play on a computer or a media device such as Apple’s iPod. You can ‘subscribe’ so that the programs are downloaded to your machine automatically. The Vintage Airstream Podcast if offering something much like a one hour radio program as their podcast. Each is about 20MB or a bit more so can take a few minutes to download even with broadband. Episode 8 starts with a Wally Byam interview cut from a Talk of the Town radio program from 1954. Music is provided by the Trailer Park Troubadours. You can listen in to Wally’s ideas for caravans some five [update- only 1, WBCCI formally established in 1955] years before WBCCI was formed and then listen to a discussion about restoration topics including the suicide doors and zolatone. VAP appears to be user supported. They are asking for donations to support the effort on their web site. They’d like you to subscribe and pay $20 – $24 per year. Production quality seems to be very good. If you like listening to your internet as well as just looking at it, this might be worth considering! In Nevada, a primary cause of traffic accidents is an inability to stay in lane. Drugs and lack of attention are factors in this but sleepiness is also an issue, especially on the long lonely straight stretches of Nevada Highways. Here’s how the power nap works: Sleep comes in five stages that recur cyclically throughout a typical night, and a power nap seeks to include just the first two of them. The initial stage features the sinking into sleep as electrical brain activity, eye and jaw-muscle movement, and respiration slow. The second is a light but restful sleep in which the body gets ready — lowering temperature, relaxing muscles further — for the entry into the deep and dreamless “slow-wave sleep,” or SWS, that occurs in stages three and four. Stage five, of course, is REM, when the eyes twitch and dreaming becomes intense. To get the perfect nap, try this. 1 Recognize that you’re not being lazy; napping will make you more productive and more alert after you wake up. 2 Try to nap in the morning or just after lunch; human circadian rhythms make late afternoons a more likely time to fall into deep (slow-wave) sleep, which will leave you groggy. 3 Avoid consuming large quantities of caffeine as well as foods that are heavy in fat and sugar, which meddle with a person’s ability to fall asleep. 4 Instead, in the hour or two before your nap time, eat foods high in calcium and protein, which promote sleep. 5 Find a clean, quiet place where passersby and phones won’t disturb you. 6 Try to darken your nap zone, or wear an eyeshade. Darkness stimulates melatonin, the sleep- inducing hormone. 7 Remember that body temperature drops when you fall asleep. Raise the room temperature or use a blanket. 8 Once you are relaxed and in position to fall asleep, set your alarm for the desired duration (see below). Plan on using them for a short break and maybe a twenty minute nap. You will be safer on the road as a result. Don’t get caught taking a nap driving your rig is going down the road! The January 2006 Newsletter has been posted. See the link. * What’s new on SNUZE? 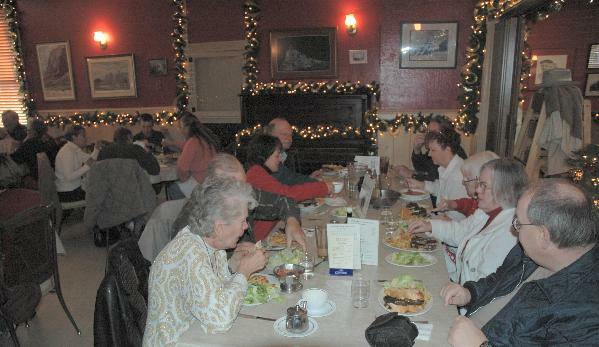 See pictures of the December luncheon at JT’s , link to the photo gallery of the 1980 SNU Mid Nevada Caravan, check out a 1947 Teardrop. ** Special luncheon February 18th. Mark your calendars and plan to attend our special 30th anniversary kick-off luncheon in Carson City at the Silver Oak Golf Club. We plan to invite some special guests and have some special celebration activities. Save this date and don’t miss the celebration. Worried about holidays weight gain? A University of Toronto post on Science Blog discusses one of those worries that festivities and food can have on those who aren’t as active as they might need to be to keep fit. U of T psychology professors Peter Herman and Janet Polivy examined more than 30 years of research to survey the principles governing overeating and obesity. They found that while medical approaches continue to emphasize hunger and satiety as the root of the obesity epidemic, these two factors are usually not the most significant causes of overeating. Instead, people allow environmental cues to dominate their eating choices, rather than adhering to selections that would satisfy their physical or nutritional needs. Portion size, palatability, variety and the food intake of fellow eaters are all potent influences on individual consumption. Norms may also become elevated depending on the social context in which they function, such as the case of the individual who, wishing to avoid appearing overindulgent, may refuse second helpings at a formal meal but accept them when eating at an all-you-can-eat buffet or among family and close friends. This might be a good time to review the diet and exercise pages in the Owner’s Guide. If you are worried about your weight – which usually means too much for those in the 40 to 80 year old regime and too little for those over 80 – you need to transfer your worries to your lifestyle habits instead. Get to know yourself and then make little changes in your routines that will lead to better health and fitness. Look for changes over months and years rather than days and weeks. The year end and resolutions for the new year are often reminders to look back to think about what we need to change for the future. Making steps, even small steps, towards better fitness will make progress towards being able to better enjoy your RV experience. Ralph Kinney Bennett describes 100 years of the history of selling gasoline. 100 Years of Fill ‘Er Up may bring back memories if you’ve been on the road for longer than you’d care to think. it is believed that the first gas station was established in St. Louis, Mo., in 1905, by two gentlemen named Harry Grenner and Clem Laessig. Their first station’s gas tank was reportedly a converted water heater. … basically of a shed and a cylindrical steel tank raised on a platform with a garden hose attached. No pump. It was “gravity fill,” with a crude filter behind the shut-off nozzle at the end of the hose to screen out impurities. By 1914, gasoline would surpass kerosene as the major product of oil refineries. The plethora of pumps along sidewalks and road berms became a traffic hazard and more. Cars lined up along the curbs of busy streets to get gas. Some of the pumps were not particularly safe or not properly operated. Gas spilled. Passing smokers were a danger. Horrific fires occurred. A great public outcry was heard. Soon, many cities began banning them. The effort to make a station stand out to the growing ranks of motorists resulted in extravagant architectural competition. The 1930s were the years that the “classic” service station took form. Oil began to be sold in sealed cans rather than re-usable bottles. Major oil companies built trademark stations with standardized art deco designs reflecting “modern motoring.” Excellent free roadmaps, free air, free water for thirsty car radiators, and, best of all, clean rest rooms, became staples of the high traffic stations. The 1950s were the final glory years of the classic service stations. Susanville still seems to be stuck barely one stage past the curbside sales. Does this town yet have an RV friendly station? Maybe someone will put a plaza on that new extension south of town. Meanwhile, watch for tight corners, low shed roofs, and deep gutters in town when you try to fuel up. 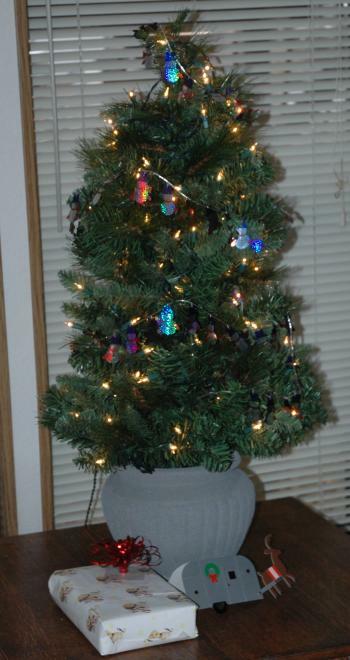 Christmas! The kids next door are building a snowman with a lot of giggles and other noise, Santa went around the neighborhood yesterday in his firetruck, – is this anytime to worry about leaks in the trailer? This 1947 teardrop trailer is the way people used to go trailer traveling. Similar RV’s are showing a resurgance as they are easily towed by fuel efficient minivans and small SUV’s. Some mathematician got interested in rumors about cricket chirps. if you count the number of chirps in an interval of 13 seconds, then add 40, this gives you a good approximation to the temperature in Fahrenheit. If you want to figure this out starting with the Arrhenius equation, then check out the Diary of a Black Mathematician entry on the sound of the cricket. Winter in the Great Basin is when it gets wet. Usually. This year is off to a good start with some late November showers and even a bit of snow already. This means that it is time to worry about leaks. 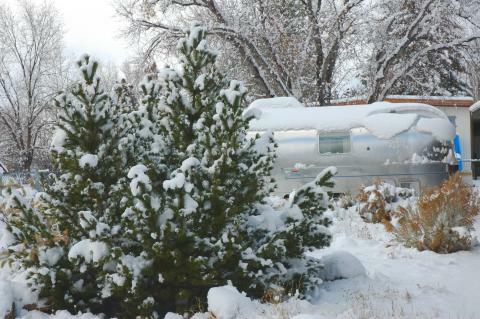 An Airstream is a bit more resistant to leaks than many other RV’s because of its construction. But leaks can still happen. One source is from fixtures added to the outside that are attached with screws. These can be solar panels or even awning rails. Another source can be windows. The vista views in seventies Airstreams in particular have seal problems. Running lights may be another source of leaks. Leaks can be difficult to find because the evidence, wetness inside, can be quite a ways removed from the source. One interesting method to find leaks has been developed into a product for RV dealers and repair shops by Sealtech Manufacturing Inc. – RV leaks bubbles recreational vehicles. What this does is to pump air into the RV and then soap down the exterior looking for bubbles as air leaks out. You might be able to do something like this with a shop vac, some duct tape, and a bit of ingenuity to fix your own leaks. The first task would be to route the shop vac exhaust into the trailer. On an Airstream, this might be easiest using a piece of cardboard with a hole for the vac hose fitted into a storage hatch door opening. The next task would be to plug the big holes. These would be the fridge vents (top and bottom) and the stove vent. Garbage bags covering the vent and taped around the edges might do the job. At this point you can start filling the mouse holes. Expanding foam might do for some cracks. Sealed patches might do for others. Caulk for others. A decent sized shop vac will push enough air to build up a bit of inside pressure despite a few small holes. The Sealtech product claims it has a pressure control but it is hard to see how any air source that runs off a standard 110v circuit could build enough pressure to cause any problems. To be sure you could add a water manometer, such as used to determine gas pressure to your stove and furnace, to the air entrance fixture. Keep in mind that simple fans have been used to pressurize the insides of collapsable buildings to hold up the roof. It shouldn’t take much air in an RV to get air flowing out through leaks. Once all the visible holes have been patched or covered, it is time to start seeing if you can blow bubbles. A bit of dish soap in a spray bottle of full of water is the tool here. And there is a skill involved. The oldest method of leak detection, soap bubble testing, is simply the observation of a pressurized component that has been sprayed or brushed with a soapy solution. Soap bubble testing can detect very small leaks allowing the operator to pinpoint the exact location of a leak. However, the process is highly dependent on the skill and patience of the operator. This can be a factor if the operator’s perspective is limited. For example, small leaks may remain hidden on the reverse side of a component or in a recess. This is a common occurrence in the aerospace industry where components are usually packed into tight spaces. Another consideration when using soap bubble testing is that sometimes larger leaks do not cause the formation of bubbles. Instead, the compressed air blows away the soap solution, and the inspector may fail to observe such a leak. To find out a bit more about leaks, check Big Blu Manual 4 classifies six different kinds of leaks in refrigeration systems. If soap isn’t good enough for you, see Leak Tec – Thin Film Bubble Testing Solutions and find out about the technology involved. For an example of leak detection and repair, see How to Fix a Leak … in the HULK! Will this idea of pumping air into an Airstream to find leaks work? Don’t know. Haven’t tried it, yet. But it sounds good, shouldn’t cost too much to try, and would only take a bit of time. What do you think? UPDATE: One notes that you need to plug the sinks and drains so as to not blow air out through the gray waste tank. This shouldn’t be a problem with the black tank unless you have a sink that drains directly into it. Another notes that a big squirrel cage fan, such as used in swamp coolers might be a way to get pressure inside. Others note that a Fantasistic Fan might move enough air to work for this purpose. See the pictures from the SNU 1980 Mid-Nevada Caravan. This picture is the approach to Kennecott’s huge Ely digs. Michael Yon writes this column about his birding in Iraq. He has written first hand reports of his experiences with soldiers and this column also has a bit about his correspondence with soldiers and families. The focus though is on birds. He is not a professional photographer so many of his pictures are of the sort we might take of birds we see in our travels. A Skunk Walks into a Bar . . . Fighting beer’s fouler flavors by Aimee Cunningham has a simple summary of the steps in making beer in the effort to describe the chemicals that make up its flavor. The first push to delve into the mystery of beer flavor occurred in the mid-1970s, when a team of flavor chemists from 40 countries identified 800 chemical compounds in the beverage. Beer, as with other alcoholic beverages, was used in the past to provide a safe ‘water’ supply. Ships were often dependent upon their beer much like an RV is on its fuel. This article makes it clear that beer can accumulate some unpleasant tastes over time which may explain why hard liquor was often used instead. Cunningham’s article is a good summary of the beer making process and how each step contributes to the flavor of the result. Much like coffee, the flavor of beer is the result of many different compounds whose impace in the final product is the result of time, temperature, and components used.